The Great Lakes Stewardship Initiative was looking for more than a web site, but a communications partner. From helping them assess their needs to making things happen, our work has helped them move forward through a time of organizational growth. The Great Lakes Stewardship Initiative was moving into a new phase— from a nonprofit that was part of the Great Lakes Fisheries Trust to an independent one. Along with this organizational shift came the opportunity to revisit their communications strategies, to develop a new web site and refresh the print materials that would be needed. We were challenged to bring some fresh energy to their communications and to help the organization share their impact in a way that was clear. Place-based education is an innovative approach, with many benefits to individual students, teachers, and whole communities as well as the environment. Yet, even in the educational community, the concept (and the term itself) are still becoming mainstream. Move away from academic text to inviting language that’s clear and concise. Make sure the organization’s voice and messaging uses everyday language. A revised logo that keeps things steady but advances your mission of clarity and simplicity. A new URL. 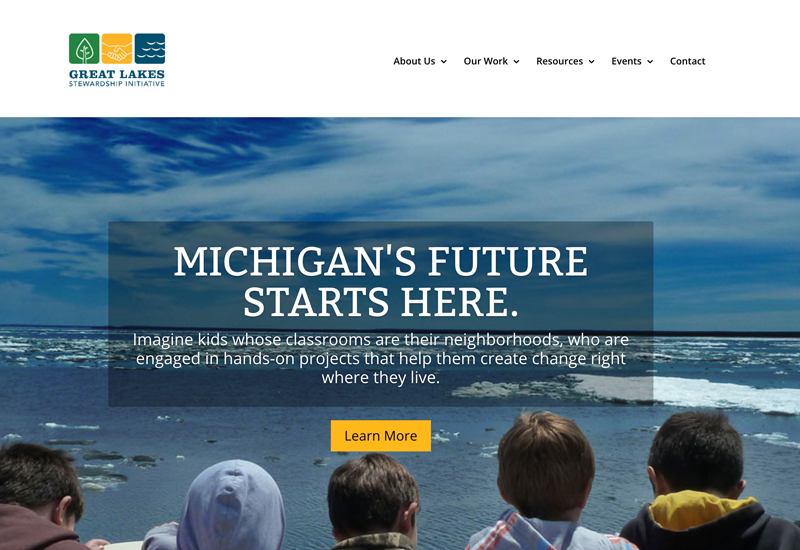 We suggested GreatLakesStewardship.org instead of the existing glstewardship.org, because spelling out Great Lakes is more memorable and brings in the concept of the nature/environment as well as identifying the region in a way that is more direct. We created a web site that was more visual than the existing site and could be easily updated by the clients as needed. Like many nonprofits, the client had a web site that had grown over the years as the organization changed and added pages. We developed a clear site structure that could grow as the organization did. A printed case statement with an illustrated map of the hubs contained strong, and clear, messaging around the benefits of place-based approach to learning. Photography of two student projects (thank you Leisa Thompson and Rod Sanford!) helped expand the library of images for use across multiple platforms. Our work with the Great Lakes Stewardship is ongoing. 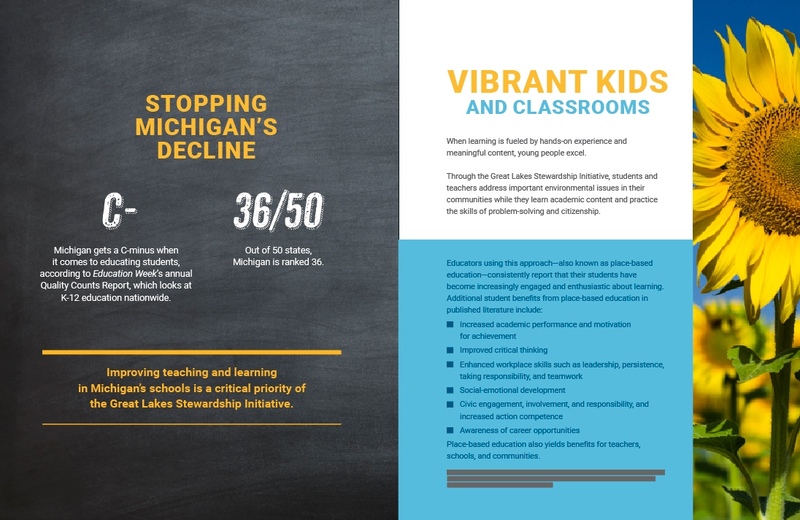 We’re pleased to have helped them through their transition, and that the visual identity reveals the power and potential of an innovative and effective statewide educational network.